The Phottix Cleon II is a hybrid wireless / wired remote control that operates on radio frequency. My review of the Cleon II covers its use with the Nikon D90, but the principles remain the same with any compatible DSLR (digital SLR camera). An overview of the Phottix Cleon II is given in the video clip linked to below — just click on the thumbnail to view the footage in high quality mode on YouTube. Alternatively, you can download the entire movie (44.7 MB) off drop.io (right-click and save to your hard drive). Cleon II Wireless Remote C6 (on eBay) — for Canon T1i / 500D / Kiss X3, XSi / 450D / Kiss X2, XS / 1000D / Kiss F, XTi / 400D / Kiss X, XT / 350D / Kiss N.
Cleon II Wireless Remote C8 (on eBay), also available on Amazon — for Canon 7D, Canon 5D Mark II, 50D, 1Ds Mark III, 1D Mark III, 40D, 30D, 1Ds Mark II, 1D Mark II, 20D. Cleon II Wireless Remote N10 (on eBay) — for Nikon D90, Nikon D5000. Cleon II Wireless Remote N6 (on eBay) — for D80, D70s. 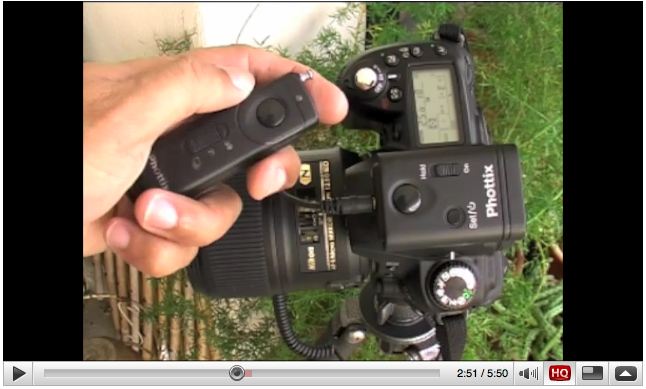 Cleon II Wireless Remote N8 (on eBay), also available on Amazon — for Nikon D300S, Nikon D3X, D700, D300, D200, D2Xs, D2Hs.